Yesterday, we worked at The Children's Museum. We started to work at 10 am. We set up two crab traps and fishing rods. I got ocean water by a bucket and then I put water into the container. We caught so much crabs. 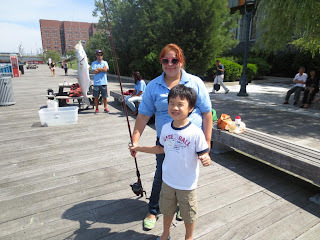 The children want to fishing, we helped the children. Some of the children want to hold the crabs. They played with the crab. Some of them got scare. A boy caught a fish. They are holding the crabs. My co-worker caught two fishes. We got more crabs, we had lunch at 1 pm. We released all the crabs. We changed the water. We caught so much crab. The children were fishing and pulled the traps up. They like to touch the crabs. 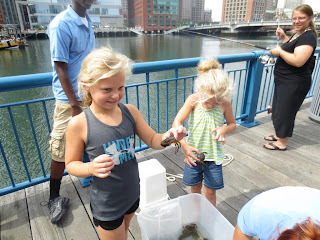 After that, children helped us to released all the crabs. We left The Children's Museum at 4 pm.